In Paris today it is the feast of Our Lady of the Miraculous Medal of the rue du Bac. I am especially fond of the rue du Bac. Never have visited there and gone away empty. Our Lady is present in the chapel of the rue du Bac in a way that is simple and disarming, powerful and gentle. She is a Mother who welcomes all who turn into her house in search of comfort, light, peace, and strength. And the Daughters of Charity are there always praying, beads in hand, ministering to the poorest of the poor by carrying their needs and sorrows before the Mother of God and by making themselves advocates with the sweet Advocate who stands above the altar, dispensing graces with outstretched hands. Is it mere coincidence that the twelve stars of the Apocalyptic Woman–Clothed–With–the–Sun, and of the Miraculous Medal, should reappear in the flag of the European Union? I for one think it is no coincidence but, rather, a providential indication that the Woman–Clothed–with–the–Sun will have the last word, even as Our Lady promised at Fatima in 1917: “In the end my Immaculate Heart will triumph” (13 July 1917). 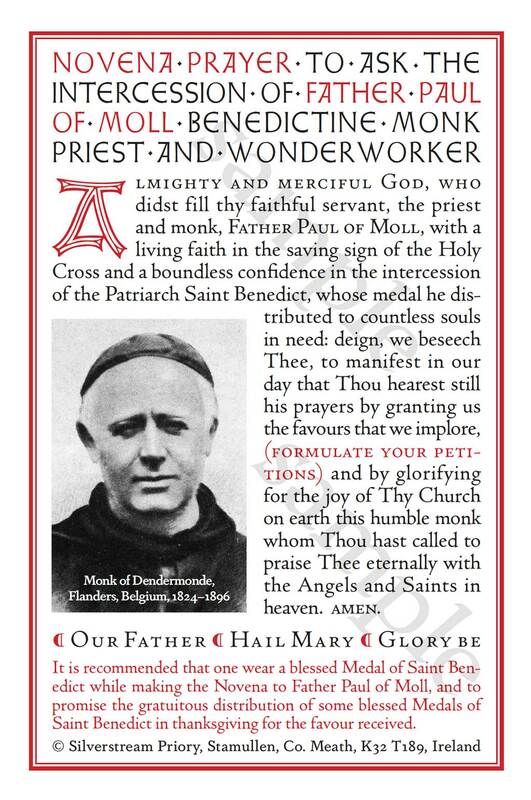 We receive many requests for a card with our novena prayer to ask for the intercession of Father Paul of Moll. 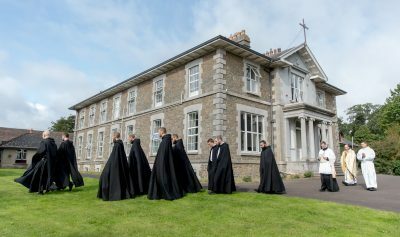 The card is once again available and may be obtained by writing to Silverstream Priory, Stamullen, Co. Meath, K32 T189, Ireland.